The most recent divine phenomenon that has taken birth in the Oneness University, is the ‘Oneness Blessing' which issues forth from the Srimurthi (portrait of Sri Amma Bhagavan, which is filled with their divine consciousness). Sri Amma Bhagavan had done the first ‘Avahanam’ (the process of impregnating an image or a form with divine consciousness) to their Srimurthi nearly 15 years ago when this movement had taken birth. 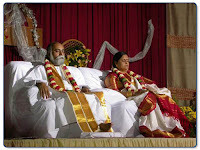 Now, Sri Amma Bhagavan have done ‘Avahanam’ to their Srimurthi, a second time, to transfer a powerful benediction to people that would awaken them to Oneness. In accordance with their divine will, the devotees pray and gently touch the Srimurthi either at the feet or hands of Sri Amma Bhagavan and ask for the ‘Oneness Blessing’. In most cases the Blessing is experienced as powerful electric shocks that almost knock down the person or as strong vibrations flowing through the body. The benediction could also be experienced in several other ways like a physical deeksha process (much the same as what is generally felt after receiving a strong Deeksha). 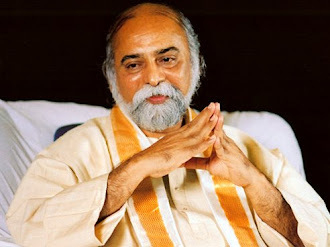 In almost all the cases so far, receiving the ‘Oneness Blessing’ from Sri Amma Bhagavan has immediately produced a shift in consciousness culminating in an altered state that is more or less permanent. Other results include mystical insights and a continuous ongoing Deeksha process within that awakens them to higher levels of Love and Joy. This divine benediction could be received directly from Sri Amma Bhagavan daily, in your own homes. The benediction could ideally be taken four times a day i.e. 5:30 a.m., 12.00 noon, 6:30 p.m. and 12.00 midnight. The reason behind fixing up these timings is that when many people pray and receive the blessing at the same time, in their respective countries, the blessing comes forth very powerfully, since it becomes like a collective phenomenon that is happening at that time. This would also profoundly affect the consciousness levels of people worldwide in a big way. The powerful effects of receiving the ‘Oneness Blessing’ at the same time is clearly seen in the case of many Deeksha givers in India and abroad already. In case of being unable to receive the benediction all four times a day, please join whenever possible; at least two times a day. 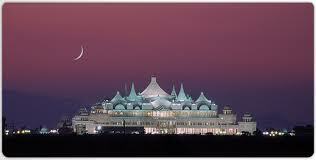 At these times of the day, you could sit before the portrait of Sri Amma Bhagavan and invoke their divine presence. Having invoked their presence, you could develop a personal communion with them in your hearts and ask Sri Amma Bhagavan to give you the Oneness Blessing and awaken you to Oneness. In case you are experiencing some emotional disturbances some day owing to the charge in your emotions, you could pray that the charge in the emotion be removed and that you are awakened to Oneness. Having prayed thus, gently touch the feet or the hands of Sri Amma Bhagavan and wait for some time with your hands on the Srimurthi for the benediction to flow through (about a minute or more). 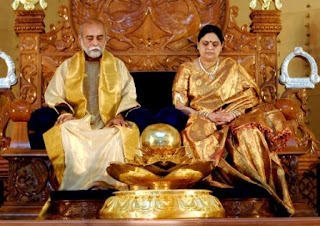 You could first touch Sri Amma and then move on to touch Sri Bhagavan or vice-versa or you could choose to place your hands on both of their feet/hands simultaneously; please follow whatever comes to you naturally. Having received the benediction thus, you could thank Sri Amma Bhagavan and if possible move into shavasan and relax for some time. This benediction would come forth from all the portraits of Sri Amma Bhagavan, including the Sri Amma Bhagavan medallions/pendants.